AUSTIN, TX – June 10, 2010 – Today Twisted Pixel Games revealed new information about their upcoming Xbox LIVE® Arcade title, Comic Jumper: The Adventures of Captain Smiley. Highlighting their announcement was information on the remaining two genres in the game, an official trailer, and the inclusion of special Splosion Man DLC within Comic Jumper! In Comic Jumper, Twisted Pixel approaches failed comic book superhero Captain Smiley after his series collapses. They offer him a chance to relaunch his comic if he agrees to work for them. Their technology allows the Captain to “jump” into other comic books and fix their storylines. Twisted Pixel’s previous announcements highlighted Smiley’s first job, a leap in the fantasy genre of comics featuring Nanoc the Obliviator. Today they reveal the game’s two additional genres: the Silver Age and Manga. Flourishing in the early 60s, the Silver Age of comics featured superheroes punishing evil while held to strict morality guidelines. Captain Smiley and foul-mouthed Star face the ire of the Comics Obscenity Commission (C.O.C. ), who constantly attempt to censor Captain Smiley and his chest-mounted sidekick. But with Silver Age heroes the Improbable Paper Pals out of commission, Captain Smiley is all that stands in the way of Mistress Ropes and her diabolical plan to grant women equal rights. 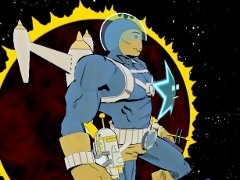 As with any of his comic jumps, Captain Smiley undergoes a total transformation when leaping into a new genre, changing his style to fit with the comic. Captain Smiley finds the Silver Age strange, but he is completely at a loss when faced with the world of Manga. Nonsensical characters, plotlines, and levels that run right to left leave Smiley and Star longing for the American comic ideals of scantily-clad superwomen and problems solved with fists and violence. Stuck in the “shojo” (we don’t know what that means either) manga Cutie Cutie Kid Cupids, Smiley battles between completing his mission and just wanting to get the hell out of there. But who needs details on the game when there are bonuses to talk about? Twisted Pixel broke new ground with The Maw, becoming the first XBLA game to offer a premium Xbox dashboard theme with the game. Last year, Twisted Pixel was the first XBLA game to offer free Avatar accessories. With Comic Jumper, Twisted Pixel tries to outdo themselves once again, offering not only free gamerpics, a free premium theme, and free Avatar accessories, but also offering free bonus levels for Splosion Man that can only be found within the game. The bonus DLC pack includes one single player and one multiplayer Splosion Man level for everyone who earns them in the game. “We really enjoy coming up with cool new ways of rewarding our loyal fans with free stuff,” says Michael Wilford, CEO of Twisted Pixel Games. Twisted Pixel is releasing their official trailer for the game, along with some sneak-peak footage of the playable demo that will be shown at E3. Though no details have emerged yet on release dates or pricing, Twisted Pixel promises up-to-the-minute postings and regular updates on the game’s progress at www.TwistedPixelGames.com and on Twitter (@comic_jumper, @mrwilford, @twistedpixjason, and @mikehasnoluck.) Finally, full reveal information and developer interviews about the making of the Silver Age levels can be found at http://twistedpixelgames.com/CJ-reveal-index.htm. After E3, Twisted Pixel will reveal additional behind-the-scenes peeks at the making of the Manga levels. Where do I begin? Even if the concept of a game that actually parodies the comics code of old didn’t get your geek juices flowing, we learn now that Twisted Pixel is one-upping itself yet again by giving out free DLC for a prior game! Seriously, I sincerely hope these guys start a trend, because making great games AND giving away stuff for other great games is a fad I could totally get behind. If you like what you see here, make sure you check out our coverage of their PAX East appearance.